Jumpstart Ventures LLC was created in 2000 as an outgrowth of DML & Associates, a firm that was founded in 1997. Four years ago we acted primarily as a marketing accelerator, helping companies launch quickly to market. ... it is more important to achieve profitability than to be first to market. As the market has changed, we have expanded our focus to help early stage companies through a wider range of strategic challenges - for today's clients it is more important to achieve profitability than to be first to market. More and more clients have been coming to us in their second or third year of operation, looking for an outside perspective and an infusion of expertise and talent to help them through an important period of transition. They want to re-energize product lines that haven't performed as well as expected, find new markets that are big enough to interest investors, segment their markets vertically to fuel growth, or refocus a go-to-market strategy in order to get leverage from limited resources. Because early stage companies with limited runway can't afford to spend money on activities or strategies that don't create traction - and they certainly can't afford to waste time - we have created a method designed specifically to help our clients move through these strategic inflection points. 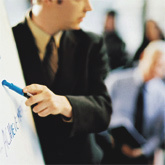 We are proficient at rapid strategic assessment. We focus relentlessly on pragmatic roadmaps. And we promptly create a framework for flawless execution so that a company can see results as quickly as possible. Today we work with more than 25 associates, numerous creative and marketing agencies, and vertical specialists to ensure that our clients get traction in their target markets.